Now is the perfect time to book an Irish Autumn Half Term, Christmas or New Year break. There is always a big rush for West Coast breaks around this time of the year with a particular focus on areas near Shannon and Galway. With this in mind here are links to those areas and other West Coast properties in Ireland. The October half term may be fast approaching but there are still some great family self catering cottages availabile in some of the most beautiful parts of the UK including the Lake District, Yorkshire, Scotland and Wales. With the colder weather on its way a cottage break is the perfect choice to get away this half term but still be in some lovely cosy accommodation in great locations. Not only can you find accommodation at great locations, you can also choose from a great range of cottage features that include everything from open wood fires and hot tubs to swimming pools and Internet access – there really is something for everyone. Take a look at some of the lovely cottages available via Cumbrian Cottages and others in the Lake District, Yorkshire, Northumberland, Derbyshire, Scotland and Wales. 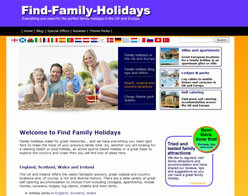 So the summer holidays are over but that doesn’t mean there are no more chances to get away this year. For example, why not get away and see the British countryside at its mellow best this October. Whether you are looking for a great family fun Half Term breaks to romantic hideaways for two, there is no better time to get out there and enjoy it. From the quiet calm of the West Country to the dramatic landscapes of Northern England…or anywhere else that takes your fancy…you’re sure to find a self catering family holiday that’s just right for you. Devon’s beaches are even more magical for family games or quiet evening strolls when the high-summer crowds have gone home. Or why not head for the Cornwall beaches for some of the best UK surfing weather. Whilst in Yorkshire it’s the perfect season for seeing moors and hills, villages and dales at their most seasonally spectacular, whether you’re with the family or just the two of you. You can find some great self catering cottages both by the coast and at idyllic country locations this October half term. If you are looking at South West England, there is a great choice of luxury cottages, cottages close to the beach, accommodation with easy walking close by and self catering with open fires. Alternatively, you could look at some lodges in the South West of England that range from the luxurious with hot tubs to those that are ideal for the family pet. You can find some great self catering cottages in Yorkshire this October half term. If you are looking at Yorkshire, there is a great choice of cottages with hot tubs, with easy walking close by and self catering with open fires and woodburning stoves. Alternatively, you could look at some lodges in Yorkshire including the Yorkshire Dales, Yorkshire Moors and Coast.